For the Argentine comic books character, see Nippur de Lagash. For the fictional planet in the Asimov story Nightfall (also known as Lagash), see Kalgash. Lagash/ˈleɪɡæʃ/ (cuneiform: 𒉢𒁓𒆷𒆠 LAGAŠKI; Sumerian: Lagaš) is an ancient city located northwest of the junction of the Euphrates and Tigris rivers and east of Uruk, about 22 kilometres (14 mi) east of the modern town of Ash Shatrah, Iraq. Lagash (modern Al-Hiba) was one of the oldest cities of the Ancient Near East. The ancient site of Nina (modern Surghul) is around 10 km (6.2 mi) away and marks the southern limit of the state. Nearby Girsu (modern Telloh), about 25 km (16 mi) northwest of Lagash, was the religious center of the Lagash state. Lagash's main temple was the E-Ninnu, dedicated to the god Ningirsu. Relief of Ur-Nanshe. At the top he creates the foundation for a shrine, at the bottom he presides over the dedication (Louvre). From inscriptions found at Girsu such as the Gudea cylinders, it appears that Lagash was an important Sumerian city in the late 3rd millennium BC. It was at that time ruled by independent kings, Ur-Nanshe (24th century BC) and his successors, who were engaged in contests with the Elamites on the east and the kings of Kienĝir and Kish on the north. Some of the earlier works from before the Akkadian conquest are also extremely interesting, in particular Eanatum's Stele of the Vultures and Entemena's great silver vase ornamented with Ningirsu's sacred animal Anzu: a lion-headed eagle with wings outspread, grasping a lion in each talon. With the Akkadian conquest Lagash lost its independence, its ruler or ensi becoming a vassal of Sargon of Akkad and his successors; but Lagash continued to be a city of much importance and above all, a centre of artistic development. The name Lagash Ki ("Country of Lagash") on an inscription on a statue of Ur-Ningirsu. After the collapse of Sargon's state, Lagash again thrived under its independent kings (ensis), Ur-Baba and Gudea, and had extensive commercial communications with distant realms. According to his own records, Gudea brought cedars from the Amanus and Lebanon mountains in Syria, diorite from eastern Arabia, copper and gold from central and southern Arabia, while his armies were engaged in battles with Elam on the east. His was especially the era of artistic development. We even have a fairly good idea of what Gudea looked like, since he placed in temples throughout his city numerous statues or idols depicting himself with lifelike realism, (Statues of Gudea). At the time of Gudea, the capital of Lagash was actually in Girsu. The kingdom covered an area of approximately 1,600 square kilometres (620 sq mi). It contained 17 larger cities, eight district capitals, and numerous villages (about 40 known by name). According to one estimate, Lagash was the largest city in the world from c. 2075 to 2030 BC. 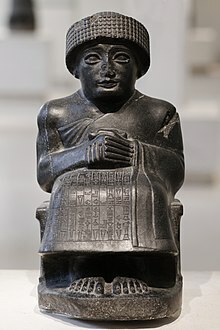 Soon after the time of Gudea, Lagash was absorbed into the Ur III state as one of its prime provinces. 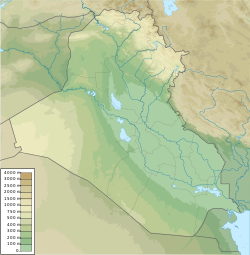 There is some information about the area during the Old Babylonian period. After that it seems to have lost its importance; at least we know nothing more about it until the construction of the Seleucid fortress mentioned, when it seems to have become part of the Greek kingdom of Characene. 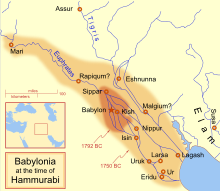 In c. 2450 BC, Lagash and the neighbouring city of Umma fell out with each other after a border dispute. 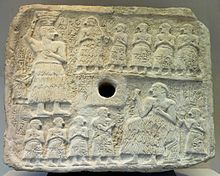 As described in Stele of the Vultures the current king of Lagash, Eannatum, inspired by the patron god of his city, Ningirsu, set out with his army to defeat the nearby city. Initial details of the battle are unclear, but the Stele is able to portray a few vague details about the event. According to the Stele's engravings, when the two sides met each other in the field, Eannatum dismounted from his chariot and proceeded to lead his men on foot. After lowering their spears, the Lagash army advanced upon the army from Umma in a dense Phalanx. After a brief clash, Eannatum and his army had gained victory over the army of Umma. Despite having been struck in the eye by an arrow, the king of Lagash lived on to enjoy his army's victory. This battle is one of the earliest organised battles known to scholars and historians. These dynasties are not found on the Sumerian King List, although one extremely fragmentary supplement has been found in Sumerian, known as the rulers of Lagash. It recounts how after the flood mankind was having difficulty growing food for itself, being dependent solely on rainwater; it further relates that techniques of irrigation and cultivation of barley were then imparted by the gods. At the end of the list is the statement "Written in the school", suggesting this was a scribal school production. A few of the names from the Lagash rulers listed below may be made out, including Ur-Nanshe, "Ane-tum", En-entar-zid, Ur-Ningirsu, Ur-Bau, and Gudea. 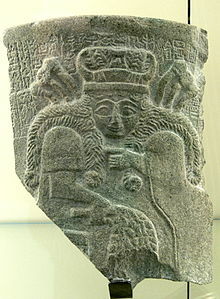 En-anna-tum I c. 25th century BC brother to Eanatum, high priest, Ur-Luma and Illi of Umma, as well as Kug-Bau of Kish gained independence from him. Urukagina c. 2300 BC king, defeated by Lugalzagesi of Uruk, issued a proclamation of social reformes. At the time of Hammurabi, Lagash was located near the shoreline of the gulf. Lagash is one of the largest archaeological mounds in the region, measuring roughly 3 by 1.5 km (2 by 1 mi). Estimates of its area range from 400 to 600 hectares (990 to 1,480 acres). The site is divided by the bed of a canal/river, which runs diagonally through the mound. The site was first excavated, for six weeks, by Robert Koldewey in 1887. It was inspected during a survey of the area by Thorkild Jacobsen and Fuad Safar in 1953, finding the first evidence of its identification as Lagash. The major polity in the region of al-Hiba and Tello had formerly been identified as ŠIR.BUR.LA (Shirpurla). Tell Al-Hiba was again explored in five seasons of excavation between 1968 and 1976 by a team from the Metropolitan Museum of Art and the Institute of Fine Arts of New York University. The team was led by Vaughn E. Crawford, and included Donald P. Hansen and Robert D. Biggs. The primary focus was the excavation of the temple Ibgal of Inanna and the temple Bagara of Ningirsu, as well as an associated administrative area. The team returned 12 years later, in 1990, for a final season of excavation led by D. P. Hansen. The work primarily involved areas adjacent to an, as yet, unexcavated temple. The results of this season have apparently not yet been published. ^ "ETCSLsearch". Retrieved 21 November 2016. ^ The Pennsylvania Sumerian Dictionary. "Lagash." Accessed 19 Dec 2010. ^ "ePSD: lagaš[storehouse]". Retrieved 21 November 2016. ^ Grant, R.G. (2005). Battle. Great Britain: Dorling Kindersley Limited. ISBN 978-1-74033-593-5. ^ "The Electronic Text Corpus of Sumerian Literature". Retrieved 21 November 2016. ^ Amiaud, Arthur. "The Inscriptions of Telloh." Records of the Past, 2nd Ed. Vol. I. Ed. by A. H. Sayce, 1888. Accessed 19 Dec 2010. M. Amiaud notes that a Mr. Pinches (in his Guide to the Kouyunjik Gallery) contended ŠIR.BUR.LAki could be a logographic representation of "Lagash," but inconclusively. This article incorporates text from a publication now in the public domain: Chisholm, Hugh, ed. (1911). "Lagash" . Encyclopædia Britannica. 16 (11th ed.). Cambridge University Press. p. 72.